Yeah, it’s that time of year again. The Seventh Annual Taste of Northfield, featuring great food from local restaurants, a performance by the Northfield Community Band, a silent auction, a James-Younger Gang Bank Raid Reenactment, balloon animals and face-painting, a performance by the Rice County Roosters, a $1,000 cash raffle, MOM Brands Create-a-Snack, a street dance with Big Wu, and the Beer and Wine Tent on the bridge. It’s 5:00 to 11:00 p.m., in Bridge Square…in downtown Northfield, MN. 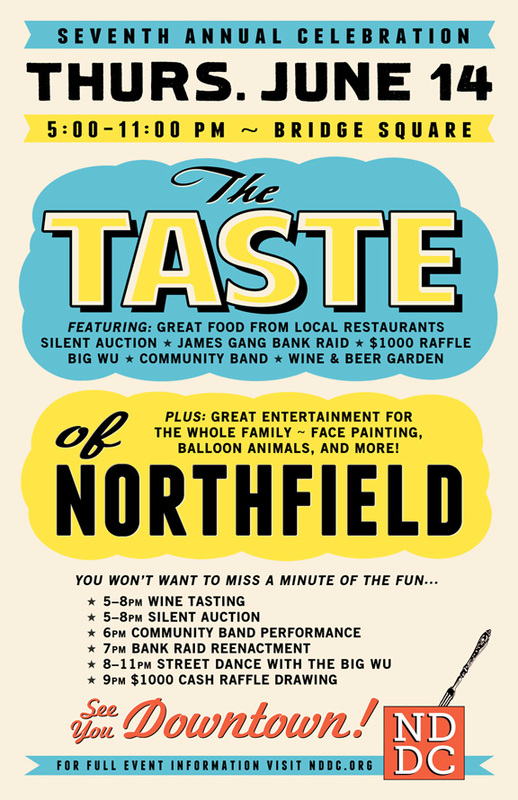 So come on down(town) and join us for the Taste of Northfield. Thursday, June 14th: Wake-Robin, 12:00 to 1:00 p.m., Bittersweet; Taste of Northfield, 5:00 to 11:00 p.m., Bridge Square; Marc Reigel and Friends, 8:00 to 10:30 p.m., Contented Cow; and Mark Mraz, 8:30 to 11:00 p.m., Tavern Lounge. Friday, June 15th: Ad Hoc Duo, 6:00 to 7:00 p.m., Contented Cow; Charlie and Timo’, 8:00 to 10:30 p.m., Contented Cow; Matthew Griswold, 8:00 to 11:30 p.m., Tavern Lounge; and Matt Arthur and the Bratlanders, 8:30 p.m. to 1:00 a.m., Upstairs Rueb. Saturday, June 16th: Riverwalk Market Fair, 9:00 a.m. 2:00 p.m., Bridge Square; Chance Meeting, 5:00 to 7:00 p.m. Contented Cow; Area 51…Unplugged, 8:00 to 10:30 p.m., Contented Cow; Relativity, 8:00 to 11:30 p.m., Tavern Lounge; and D J Music, 9:00 p.m., Upstairs Rueb. Sunday, June 17th: Politics and a Pint, 6:00 p.m., and Quiz Night, 8:00 p.m., both at the Contented Cow.